When architect Dame Zaha Hadid CBE died at the age of 65 in March 2016, she left behind a trailblazing legacy that spanned decades of prize-winning architecture around the world. 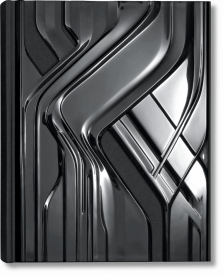 Renowned for her innovative and unique architectural forms, large-scale projects, and iconic buildings, Zaha Hadid developed a characteristic visual style over her career, imbuing her architectural practice with expressive, sweeping fluid forms. The first female architect to win the Pritzker Prize, her blend of techniques perfectly evokes the simultaneous harmony and dissonances of modern life. And her success was phenomenal; during her lifetime a number of books chronicled her work and she amassed prestigious commissions, awards, and honors, including the RIBA Gold Medal. 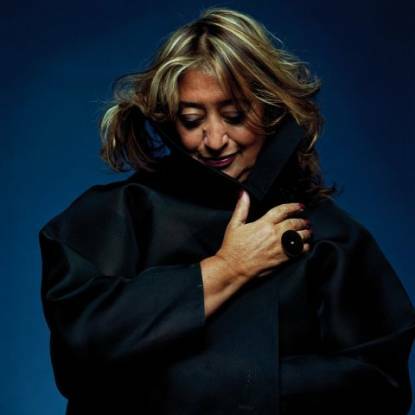 An Iraqi-British citizen of Muslim heritage, Hadid defied categorization and cliché, focusing on creating vast, beautiful buildings in her signature, curvilinear style. She designed hundreds of iconic, eye-catching structures around the world, including the MAXXI Museum in Rome, the Guangzhou Opera House in China, and the Phaeno Science Center and BMW Central Building both in Germany. In 2006, the Guggenheim Museum in New York staged a retrospective spanning her entire career to date, the latest in a long line of museums around the world featuring Hadid in exhibitions. Her pioneering use of parametricism and neo-futurism was key to her early discovery as a global figure when her drawings were included in the groundbreaking 1988 exhibition Desconstructivism In Architecture, curated by Philip Johnson and Mark Wigley at New York’s Museum of Modern Art. A student and later professional partner of Rem Koolhaas, she founded her own practice Zaha Hadid Architects in London in 1980 which went on to achieve global success. 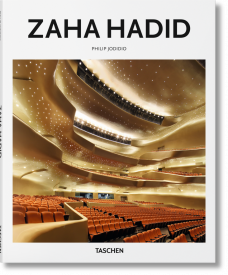 Philip Jodidio’s TASCHEN books on Zaha Hadid offer a superb introduction to the evolution of Hadid’s career, Hadid: Complete Works 1979–today provides a compendium of the architect’s complete works, right through to the new Serpentine Sackler Gallery in London. 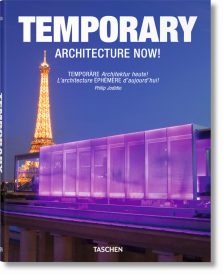 Filled not only with outstanding photographs of Hadid’s amazing architectural creations, the book also includes the furniture and interior designs that were integrated into her unique, and distinctly 21st-century, universe.